Watermelon is so sweet and juicy that it is practically a beverage right off the vine. A bit of added water makes it truly quaffable. 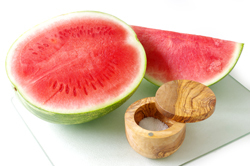 Watermelon Is lower in sugar than other melons (6.2 percent, as opposed to the 7.8 percent of cantaloupe and 8.6 percent of honeydew), but it is also very low in sodium (1 percent, as opposed to the 16 percent of cantaloupe and 18 percent of honeydew), which means it can be bland when juiced. A little bit of sea salt takes care of that. 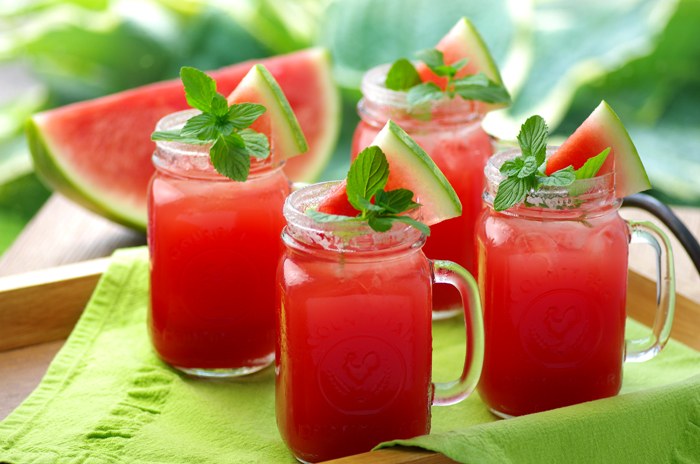 A glass of watermelon juice tastes sweet but has only 60 calories. 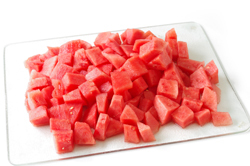 Cut the rind from the watermelon and chop the flesh into small pieces, trapping any juices that flow out. 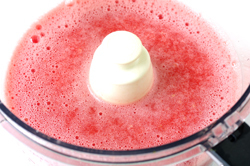 Combine the chopped watermelon flesh, collected juices, and water in a blender or food processor. Process until pureed. Set a strainer over a large bowl and pass the pureed melon through the strainer, stirring the loose puree gently as it strains to get as much liquid through as possible without forcing any solids into the strained liquid. Discard the solids, and stir the salt into the watermelon liquid. Note: Because watermelon juice is so naturally watery, it cannot be diluted with seltzer into a sparkling beverage. It must be carbonated in a soda siphon. Pour the juice into a 1-quart soda siphon. Charge with CO2 according to the manufacturer’s directions. Siphon-charged sodas can be stored in the siphon in a refrigerator for up to 5 days. Disperse as desired into tall glasses filled with ice, and serve. Garnish with more sea salt, if desired.